I’ve been holding off writing about this until it was official, and now it is: the area of the arctic covered by sea ice has reached a record low. 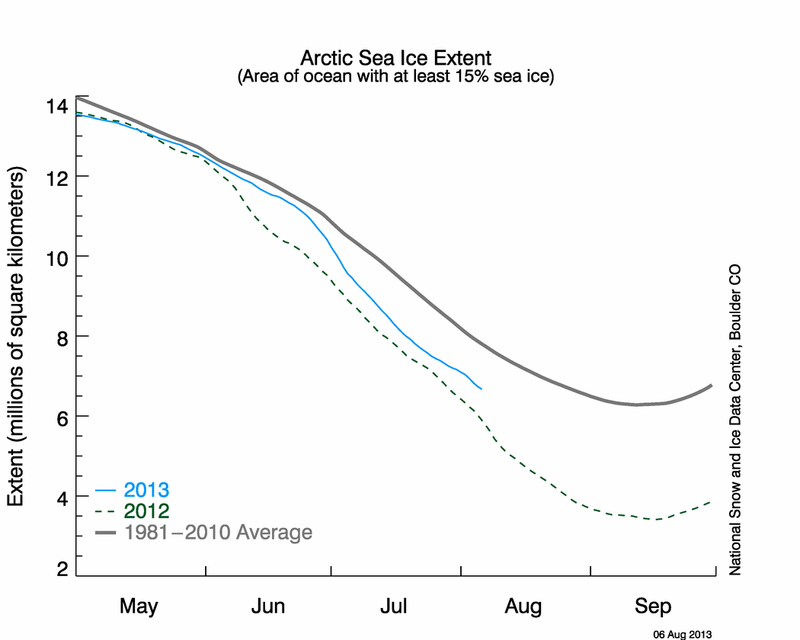 "Sea ice extent" is (more or less) a measure of the amount of ice covering the sea surface. It’s measured using satellite data; the area is divided into many bins, and sea ice extent is calculated by adding up all the bins with more than 15% ice in them. Every year the ice starts to grow in the autumn and melts in the summer, so you get a sine-wave curve of extent every year. As you can see, we’re still on the way down, weeks ahead of the date of the lowest extent in 2007. The minimum extent in 2007 was reached on September 16. In 2011 – which had the second-lowest extent on record, essentially equaling that of 2007 – lowest extent happened on September 9. This year it was August 25. Notice any trend there? I don’t want to make too much of the idea that it’s happening earlier every year because there aren’t enough data points, but it’s consistent with the Earth’s temperature increasing. The massive heat wave that melted so much ice in Greenland this summer may have something to do with this as well. Here’s a map from the National Snow and Ice Data Center showing the extent for August 25, 2012. The orange line is again the average for August 25 taken over the years 1979 – 2000. White shows ice, blue is ocean, gray is land; you can see Greenland directly below the ice, with Canada and the US to the lower left. 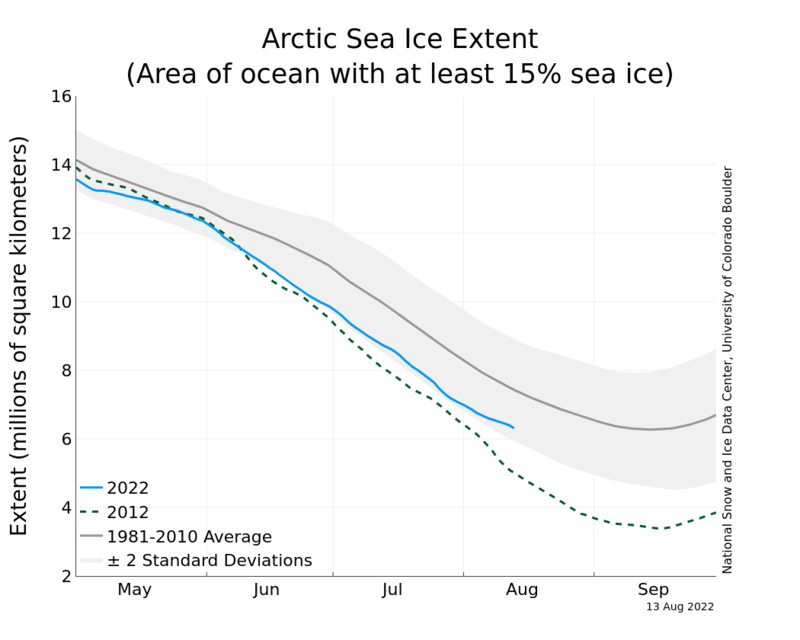 Obviously, the sea ice extent for August 25 is way, way below average compared to the past. I’ll be honest: this map and graph are making me unhappy. The fantastic website Skeptical Science has more about this. The most worrisome aspect of this to me is how this accelerates. Ice is bright white, so it reflects sunlight. Sea water is much darker and absorbs that light. 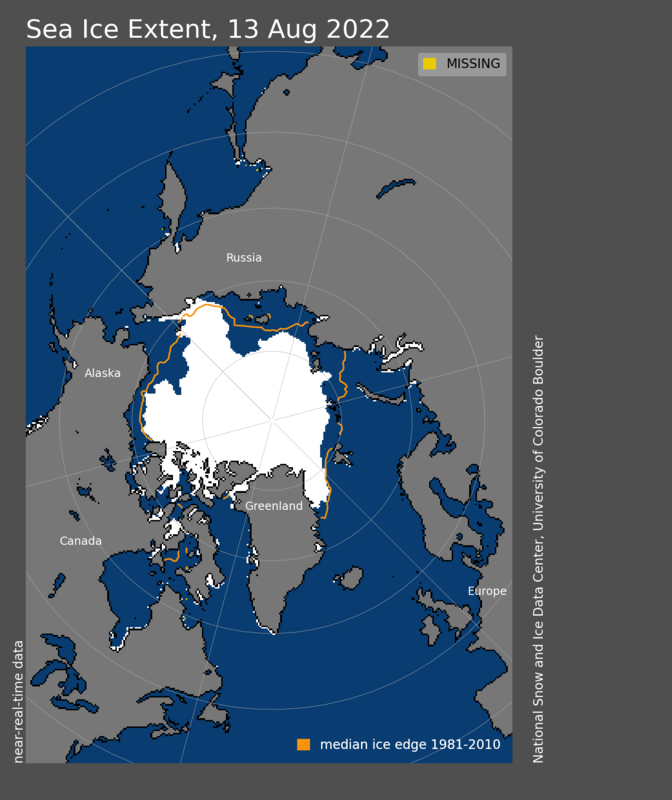 So the more ice you lose, the darker overall the arctic gets, and the faster it melts. Far from being a fluctuation, these records getting broken are more likely a trend, and it’s more likely we’ll see more of them.